Framed by fragrant woodland in secluded Dassia Bay, Ikos Dassia offers a contemporary Mediterranean style, traditional Greek hospitality and a fabulous beachfront setting. From renowned Ikos hotels, the highest level of service and quality is guaranteed. 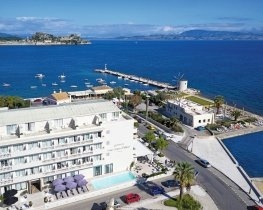 This luxury five-star resort boasts extraordinary views of the Ionian Sea and Corfu’s verdant coastline. 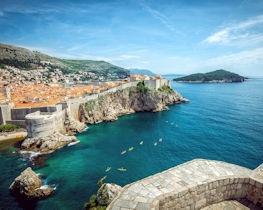 There is a wide choice of elegantly designed accommodation including interconnecting family rooms as well as suites and villas, some with private gardens and individual pools. There are numerous outdoor pools, some exclusively for adults, evening entertainment and the hotel’s private beach is a beautiful stretch of fine white sand complete with beach service. Dining options range from buffet style to fine dining menus with six à la carte restaurants. The spa by Anne Semonin is a serene space in which to relax. Families and younger guests are well looked after with activities, a football academy (charge), playground, separate pool and kids club run by renowned brand worldwide kids. The award-winning Infinite Lifestyle all inclusive concept ensures unlimited luxury that doesn’t compromise on quality. Guests can enjoy a huge array of entertainment, activities and facilities included in their holiday. Breakfast, lunch and dinner is served in buffet and à la carte restaurants. International drinks, wines, cocktails, coffees and teas, sweets and snacks are served throughout the day and a fully stocked mini bar is replenished daily. Sunbeds and umbrellas are complimentary by the pool and on the beach as well as 24-hour room service. Usage of kid’s club, teen club, indoor pool, steam room, sauna and gym is included and much more. Select a deluxe category room and enjoy the exclusive benefits of Deluxe Collection. The exceptional rooms, exclusive areas and upgraded services are perfect for the most discerning guests. Deluxe Collection privileges include: exclusive pool, reserved beach area, premium room service, upgraded mini bar, dedicated manager, exclusive check-in and check-out, concierge, upgraded beach and pool service including unique snacks and cocktails, bottle of champagne on arrival, premium bathroom amenities, pillow menu, turndown service, PS4 on request, movie library, one special dinner on the beach and a complimentary spa treatment (2 neck and back massage per room per stay). Promo double rooms are contemporary and modern in style. Decorated in clean whites and fresh blues with stunning views of the hotels gardens. Located in the main building, double rooms feature furnished balconies, panoramic windows, DVD and flat screen TV, hairdryer, bathrobe and slippers. Decorated in calming whites with fresh, modern furnishings, promo sea view rooms overlook the glistening Ionian Sea. Located in the main building, promo rooms feature furnished balconies, panoramic windows, DVD and flat screen TV, hairdryer, bathrobe and slippers. More spacious than promo rooms, superior double rooms offer modern and contemporary furnishings with views of the hotels gardens. Located in the main building, superior rooms feature furnished balconies, panoramic windows, DVD and flat screen TV, hairdryer, bathrobe and slippers. 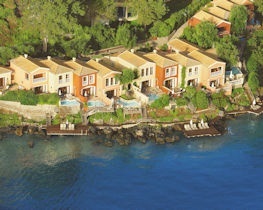 Located in the main building superior sea view rooms boast superb views of the Ionian Sea. These spacious doubles feature furnished balconies, panoramic windows, DVD and flat screen TV, bathrobe and slippers. Junior suites boast stunning panoramic windows providing ample light in to the spacious suite. The open plan junior suites feature peaceful garden views, a sitting area, furnished balconies, panoramic windows, DVD and flat screen TV, bathrobe and slippers. Junior suites boast stunning panoramic windows providing uninterrupted sea views. Spacious and open plan, junior suites feature a sitting area, furnished balconies, panoramic windows, DVD and flat screen TV, bathrobe and slippers. These spacious sea facing suites offer a comfortable open plan space for families. The large elegant sitting area and generous balcony boast extraordinary views of the sea. Panorama junior suites feature furnished balconies, panoramic windows, DVD and flat screen TV, bathrobe and slippers. Guests staying in a deluxe junior suite garden view receive the superb benefits of the Deluxe Collection including upgraded amenities, exclusive areas, private check-in and much more. The open plan junior suites combine a modern bedroom with a spacious sitting area overlooking the hotels gardens. Panorama junior suites are full sea facing to make the most of the stunning sea views. The spacious open plan living space features a large double bed, sitting area and private garden. They include furnished balconies, panoramic windows, DVD and flat screen TV, bathrobe and slippers. The deluxe junior suite private pool garden view includes the premium benefits of the Deluxe Collection. Elegant and spacious the suites include an open plan living space with a private heated pool. Overlooking the gardens, guest can enjoy a tranquil atmosphere on their balcony. Ultra-spacious and stylish, the family style one bedroom suite offers a separate bedroom and lounge for extra privacy. The extensive balcony boasts spectacular views of the sea. Suites feature furnished balconies, panoramic windows, DVD and flat screen TV, bathrobe and slippers. Ideal for families, the family room inland view consists of two double rooms interconnecting. Located in the main building, each feature furnished balconies, panoramic windows, DVD and flat screen TV, bathrobe, slippers and views of the hotels gardens. Family rooms are a superb option for families. Consisting of two double sea view rooms interconnecting there is plenty of space. Each room features furnished balconies, panoramic windows, DVD and flat screen TV, bathrobe, slippers and views of the Ionian Sea. Located on an exclusive beachfront, deluxe two bedroom villas include two separate bedrooms, separate living room and a large private pool. The villa style accommodation ensures the highest level of privacy. The villa includes access to the Deluxe Collection services and amenities. Michelin star chef Lefteris Lazarou has created a tempting menu of the finest Greek flavours with a contemporary twist. The open-air setting is a wonderful place to start the day and relax in the evenings. Example dishes include: lamb Kleftiko with potato puree, traditional moussaka, poached pear. Opening hours: breakfast 7:30am - 11am; lunch 1pm – 3.pm; dinner 7pm – 10:30pm. *Please note a reservation is required. A select children’s menu and baby food is available on request. À la carte menus are available for dinner only. Fresh ingredients and great skill come together to create a delightful Italian style menu. Originally from Rome, Michelin star chef Andrea Fusco brings Italian finesse to Corfu. The superb à la carte menu is complemented by over 300 wines carefully selected by Ikos Sommeliers. 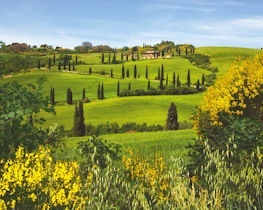 Example dishes include: Caprese salad, chicken saltimbocca with prosciutto and risotto, Tiramisu. Authentic tastes of China, Thailand and India are infused by Japanese chef Katsuhiko Hanamure (Katsu). The à la carte menu can be enjoyed indoors or al fresco on the balcony with glorious sea views. Example dishes include: Miso marinated salmon with jasmine rice, lentil dahl with vegetables, matcha green tea and white chocolate mousse. Dress code: no shorts or flip flops are permitted for dinner. The Pourcel brothers (Jacques & Laurent) are experts in fine French food. Their creative style is evident in the superb provincial cuisine on offer at Provence. The peaceful, intimate setting is the perfect back drop for special occasions. Example dishes include: Foie gras with beef patties, veal noisettes with red wine sauce, profiterole topped with vanilla cream. Taste the very best of local Corfu cuisine with a contemporary twist. A delicatessen style restaurant serving delightful Greek flavours and à la carte dinner. Flavors offers a beautiful dining room with floor-to-ceiling windows giving way to beautiful Ionian Sea views. The Mediterranean style buffet is complemented by a superb selection of wines. The restaurant is overseen by chef Giannis Vasiliadis. The Ikos dine out concept allows guests to enjoy the local cuisine and still enjoy the benefits of all inclusive. Guests can enjoy some of the best local restaurants at no extra cost. The concept is perfect for a special evening out, something a little different or authentic Greek hospitality. *A reservation is required at local restaurants. Whether you prefer a relaxing terrace overlooking the sea, a warm indoor bar or something a little livelier, Ikos Dassia offers many places to enjoy your favourite tipple. All with impressive wine lists, expertly mixed cocktails, premium beers and a program of live music and entertainment. Located in the hotel’s theatre. The Ikos spa by Anne Semonin is a tranquil and revitalising environment to cleanse and relax. The spa’s experienced therapists can personalise treatments to reflect both skin type and lifestyle. Overseen by renowned beauty brand Anne Semonin, the highest quality products and service is assured. The spa pool area is free to use for guest, treatments are not included. Please note access to the indoor spa pool for children under 16 is restricted to splash hours only and must be under adult supervision (April – October, 8am – 1pm). Ikos Dassia offers a choice of heated indoor and outdoor pools with separate children and baby pools to entertain families. The hotel’s long private beach is a stunning stretch of fine white sand lined with fragrant pine and olive trees. Plenty of luxurious sunbeds are available and refreshing drinks and snacks are delivered directly to you. The clear turquoise waters of the Ionian coast shelve gently providing easy swimming for families. Deluxe collection guests have their own private beach section where upgraded sunbeds, towels and waiter service is provided. For children, there is a beach based childcare service (extra charge). At Ikos Dassia children of all ages are catered for. Fun, games, events and learning are all organised by UK childcare company, Worldwide kids. The professional and highly trained staff assure that children have the best holiday ever. Be it water sports, cooking, arts and crafts or playground time there is plenty to keep children entertained. A babysitting service is also available on request. Kids club for ages 4 – 11 years. Open: morning session 10am – 1pm; lunch session 1pm – 3pm; afternoon session 3pm – 6pm. Creche (extra charge) for ages 4 months – 3 years. Open: morning session 10am – 1pm; lunch session 1pm – 3pm; afternoon session 3pm – 6pm. Teens club for ages 12 years and above operates from 1st July to 2nd September. Open: morning session 10am – 1pm and afternoon session 3pm – 6pm. WK Football Academy operates from 22nd May to 2nd September. Open Monday to Saturday 10am – 12pm (5-8yrs) and 5pm – 7pm (9-14yrs). The indoor playground is open 10am – 6pm. We strongly recommend pre-booking childcare sessions to avoid disappointment as the hotel runs a strict child to carer ratio. Ikos Dassia offers an extensive range of facilities in and out of water. Other fun group activities include giant chess, board games, Boccia, Greek dance lessons, Greek language lessons, Greek mythology lessons, darts, kid’s karaoke and much more. Every evening hosts a choice of entertainment with live music, theatre performances, children’s shows, exclusive parties and much more. Romantic candlelit dinner, bottle of Sparkling Wine on arrival & a farewell gift on departure (wedding certificate required on arrival). for bookings made between 18 April 2019 and 02 November 2019 and arrivals between 18 April 2019 and 02 November 2019. Prices apply to all rooms.